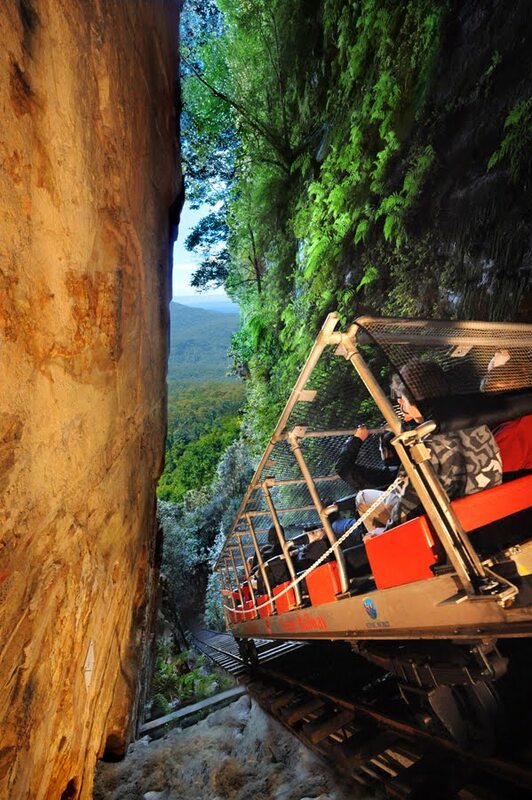 BY the time you read this, workmen will have begun ripping up the track and putting aside for the museum and as a plaything for the kids, carriages from one of Australia's great tourism icons – the near-70 year old Scenic Railway at Katoomba in the Blue Mountains west of Sydney. 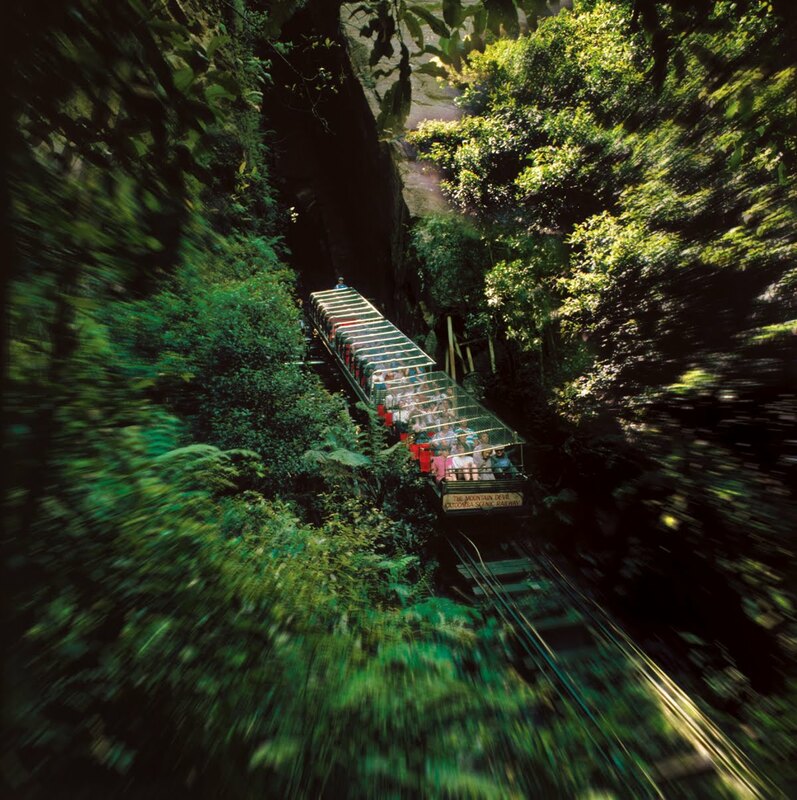 Not that it's the end of the line for this internationally-renowned attraction, which descends at a jaw-dropping 52 degrees for some 415 metres into the picturesque Jamison Valley, and is officially recognised as the world's steepest railway. For come the end of March a new $30m Swiss-designed Scenic Railway will follow the same plunging route, complete with new stations at top and bottom of the line. And it will continue a legacy that's seen the Railway since it opened in 1945 carry over 25 million passengers into the ancient rainforest of the once coal mining valleys below Katoomba. 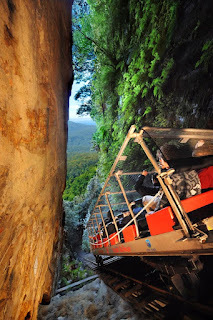 Although tourists have, in fact, been carried down into the Jamison Valley and back up again from well before 1945 – as early as 1928 they kneeled on folded chaff bags in the open wagons of a narrow-gauge coal tramway that was the actual forerunner of the Scenic Railway. It was in 1945 that Harry Hammond and his sister Isobel Fahey opened the Scenic Railway as we know it today, having bought the lease of one of a cobweb of "tram lines" built in the late 1800s to haul coal and kerosene shale out from the Jamison and Megalong Valleys. Harry and Isobel's line was the steep 52-degree track from the valley floor to a junction of the Western Railway at Katoomba, and which had gone into liquidation during World War II. But knowing its history for carrying adventurous tourists in a purpose-built carriage named The Mountain Devil during the 1930s after the demise of the coal mines, the siblings bought the 52-degree line's lease to reinvigorate the tourism boom the Mountains had enjoyed before the interruption of World War II. They registered their venture Scenic World, and as well as the Scenic Railway the company later opened Australia's first cable-car called the Scenic Skyway that traverses the Katoomba Falls gorge, and built our first revolving restaurant (at Katoomba,) a 2.4km Scenic Walkway through the canopy of the Jamison Valley's rainforest, and the Scenic Cableway into the Jamison. But it's the Scenic Railway that's the gem as both an historic and ageless attraction… and rather than just finding themselves on the Jamison Valley floor, tourists have a choice of varying length bush tracks and boardwalks to discover the captivating world of the Valley before ascending back up to Katoomba. 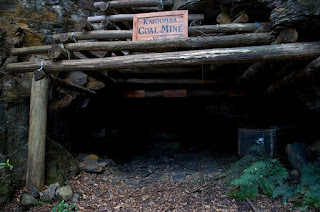 Explorers as early as 1824 had noticed coal seams in fractured cliff walls in the valleys below Katoomba, but it was not until the 1860s that the first coal and kerosene shale mines opened. Early pioneers gave landmarks and tracks interesting descriptors: Ruined Castle, the Golden Stairs, Dixon's Ladder, Narrow Neck, solitary Orphan Rock, and of course Echo Point and The Three Sisters. And when a little community sprang up in the Valley it was named Nellie's Glen after the daughter of pioneer miner, John Britty North. Nellie's Glen soon boasted a sizeable hotel, general store, bakery, butchery, post office, public hall and a school, but when mines began to fizzle out in the late 1890s, most of the settlement was pulled down and rebuilt in Katoomba, including the hotel that was re-born as the Maldwin Guest House. The remainder was engulfed by the rainforest. And in 1928 when the supervisor of one of the few remaining mines was asked by a group of aching bushwalkers if they could get a lift from the Jamison Valley back up to cliff- top in an empty tramway coal wagon, he readily agreed – not realising what he had started. For soon more and more bushwalkers were making similar requests, and with declining demand for coal coupled with the recession, the coal company realised the tourism potential and built The Mountain Devil carriage with seats rather than chaff bags to kneel on, charging sixpence (5 cents) a ride until going belly-up as a result of the Second War. GOING DOWN – these Scenic Railway carriages will soon be replaced with a new $30m Swiss-designed set. PLUNGING: an idea of just how steep is this "world's steepest railway." 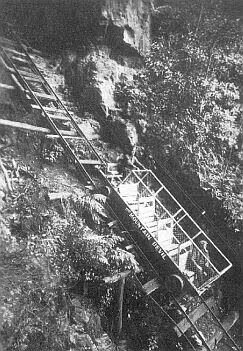 PIONEER Mountain Devil was innovative 1930s forerunner of today's Scenic Railway. 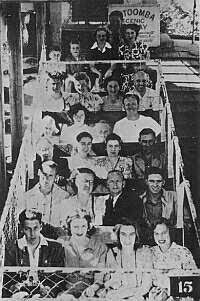 ONE of the first rides in the 1940s. 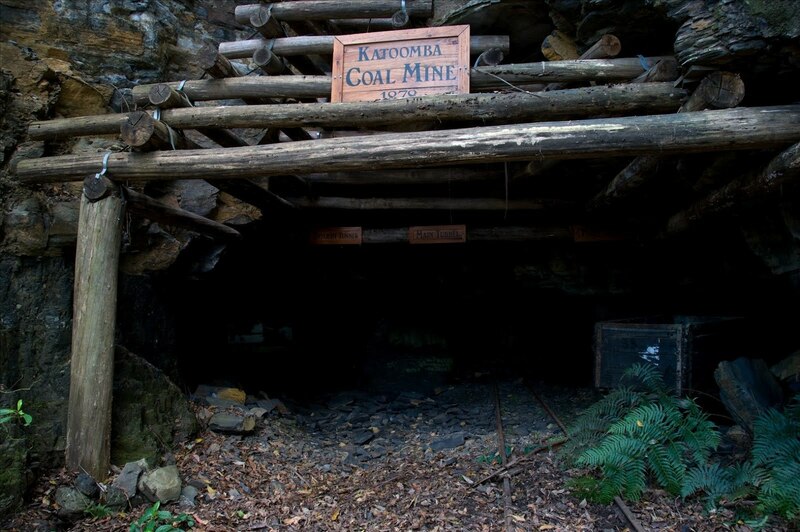 ORIGINAL 1878 Katoomba mine whose "trams" carried coal from the Jamison Valley up the 52 degree incline, and later passengers as well. 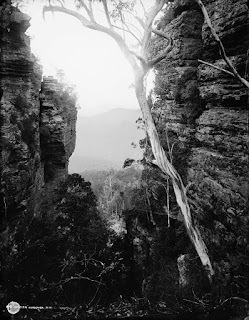 HISTORIC photo of Nellie's Glen that became Katoomba's short-lived first mining settlement.